This cake is the tastiest sort of thank you note, fit for the woman who taught me that contentment is attained through hard work, loving yourself and others, and finding joy in the small things. Whether it was an impromptu car sing-a-long or bouquet of fresh flowers added to the grocery cart (flowers needed no occasion), my happiest memories don’t stem from exotic trips or lavish gifts, but the mundane moments of daily existence transformed into magical ones. 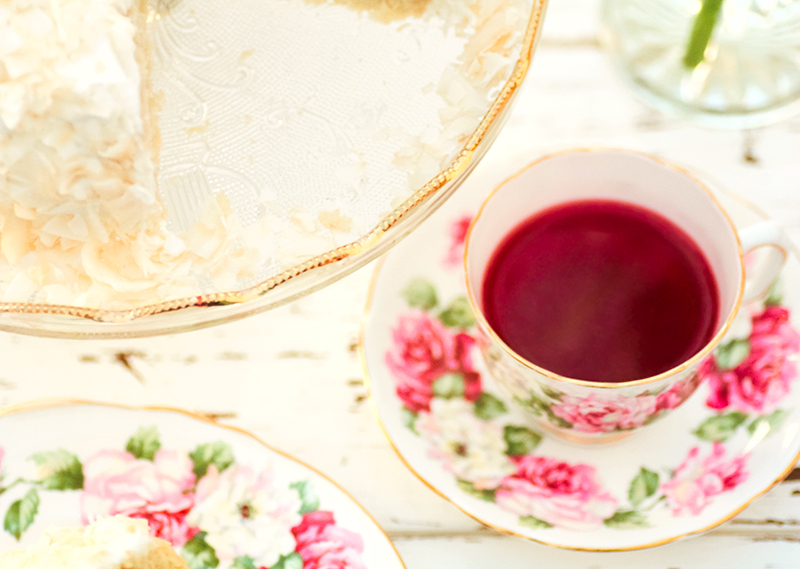 Mom loves tea, so I served the cake with this rosy-hued hibiscus tea that complimented the delicate coconut flavor well with its fruitiness. It’s Starbucks Tazo tea in the Passion flavor, and it’s delicious even without sweetener. You find this tea at your local grocery store, or online at the affiliate link above. Thankfully, the cake worth so many words has a much shorter ingredients list! The batter is a mixture of coconut and almond flour–no fancy gums or exotic flours–along with eggs, coconut milk, vanilla, and sea salt. I added a little gelatin powder (my new favorite gluten-free cake additive) to make the cake a bit more moist, since removing the sugar called for in the original recipe dries out the batter. I also played around with the preparation method. Out of the two mixing methods I tried, grinding the dry ingredients together in the food processor and beating the egg whites separately created the most tender crumb. Following my instructions exactly should yield a perfectly fluffy yet substantial cake with an even texture. If you’d like to substitute ingredients, feel free to experiment and share your results with us in the comments. 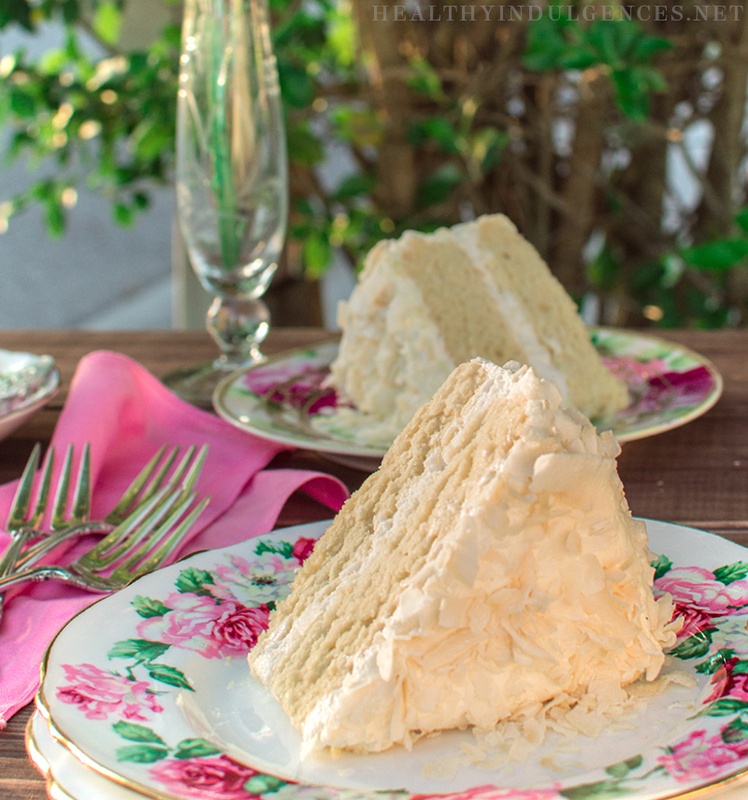 This rich yellow can easily be transformed into a coconut cake worthy of a Southern cookout! 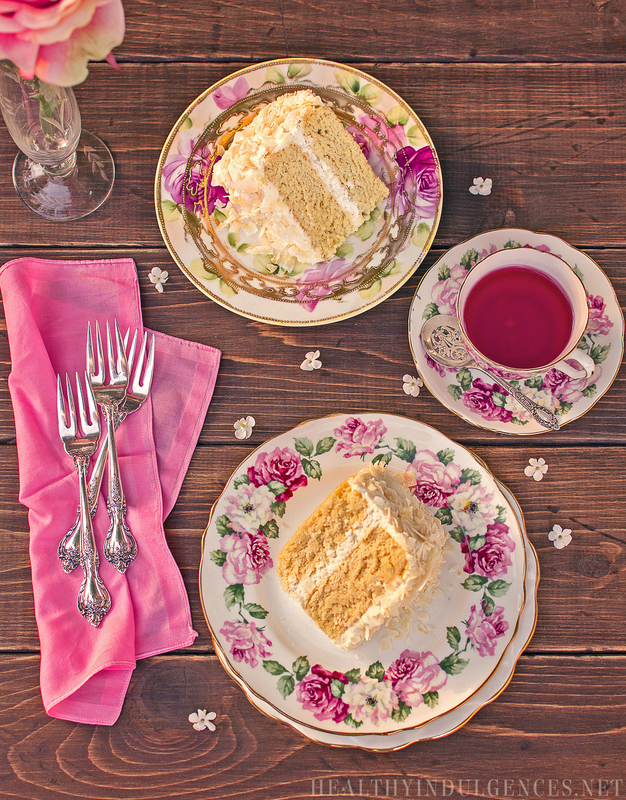 Simply fill the layers with my sugar-free sour cream filling and top with my vanilla mascarpone frosting. Preheat oven to 350 degrees Fahrenheit (176 degrees Celsius). In a glass measuring cup or pan, heat butter in microwave or over stove top until melted. Set aside. To bowl of food processor, add dry ingredients (almond flour, coconut flour, sweetener, baking powder, sea salt) and pulse for 1 minute, or until ingredients start to clump together. Separate egg whites into a clean bowl while adding the yolks to the food processor. Set aside whites. Pulse in melted butter, coconut milk, and vanilla in food processor until batter is uniform with no streaks of flour, scraping down sides once.. This could take 20-30 pulses. Using a mixer, beat egg whites until soft peaks form. Add batter from food processor to egg whites. Beat together just until white streaks are gone. Scrape batter into prepared pans and bake for 35-40 minutes, or until a toothpick tester comes out clean. If making cupcakes, bake 25-30 minutes, or until a toothpick poked into the top of cupcake comes out clean. When pans are cool enough to handle, run a knife around the edges of cakes and invert them onto cooling racks. Cool for 1 hour before frosting and serving. Powder sweetener in a Magic Bullet or food processor to grind it to a fine consistency. Whisk together sour cream (or Greek yogurt), coconut milk. Whisk in sweetener for 1 minute until it is dissolved. Spread filling between cake layers. 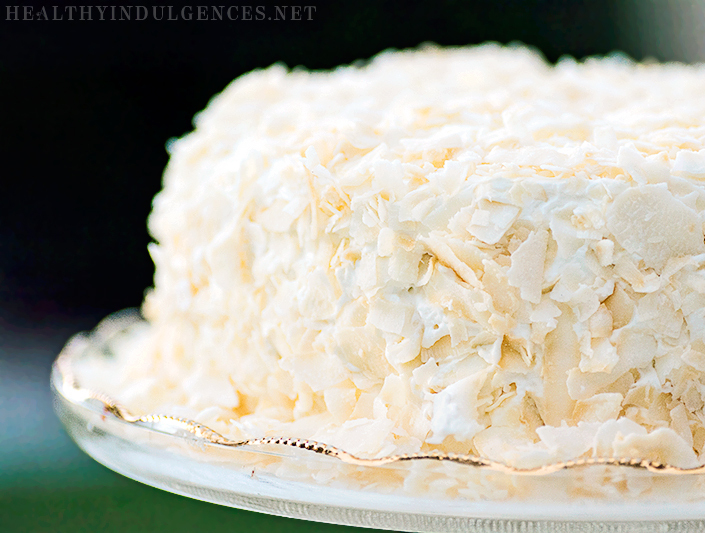 Press coconut flakes into sides and sprinkle over the top to coat cake. The above recipe was adapted from a beautiful new cookbook called Make It Paleo 2. Bill and Hayley’s gorgeous food styling caught my eye while perusing recipe round-ups (I’m a sucker for eye candy), and I wanted to see more of their work. Their paleo “Wedding Cake” was easily adapted to be low carb and diabetic-friendly, and I see plenty of other recipes with the potential to fit into a keto eating plan. I don’t eat paleo, but can appreciate the attention that the movement has brought to ingredients like almond and coconut flours. I hope that this cake will inspire to express your appreciation for a loved one with a healthier treat. Wow! I want to eat this right now! I have never enjoyed baking, but have always enjoyed eating! I will definitely give this a try! If I use Swerve instead of Truvia, do I still use 3/4ths a cup? Thanks for posting this beautiful cake! Haha, I like what you said about enjoying eating! That’s why I bake so much. 😉 If you use Swerve, you might need to add a little stevia extract. I’d start add the amount listed in the recipe (works out to be 1 1/2 teaspoons pure stevia powder) if you’re using the Trader Joe’s brand. You could always start with a little less stevia (1 tsp?) and taste the batter to see if it’s sweet enough before baking it. Hope that helps! Do you have the nutrition values, specifically the carb and fiber counts for the Beautiful Cake?? Thanks for all your hard work. 455 Calories; 42g Fat; 10g Protein; 16g Carbohydrate; 8g Dietary Fiber; 109mg Cholesterol; 326mg Sodium. Exchanges: 1/2 Lean Meat; 1 1/2 Fat; 0 Other Carbohydrates. Per Serving (excluding unknown items): 172 Calories; 18g Fat (93.2% calories from fat); 1g Protein; 2g Carbohydrate; 0g Dietary Fiber; 62mg Cholesterol; 20mg Sodium. Brenda, thanks for the kind words! Nice to see you commenting. 🙂 Mom enjoyed the post, too. She teared up a bit! I need direction on when to add the gelatin and how much sweetener should be in the filling. My filling was soupy. Would the amount of sweetener take care of that? I made the crunchy chocolate bars and they are fabulous. I’m addicted. I have a lot of erythitol now. can you tell me how to substitute that for the stevia in the cake? Stevia tastes bitter to me and I don’t like using it. I have the same question about the gelatin. I put it in the cake. I hope that was the right thing to do. Should it have gone in the filling? It is supposed to go in the. 🙂 How did it turn out for you, Samantha? The gelatin does go into the cake. Fixed the recipe. 🙂 How did it turn out for you, Samantha? It was fabulous! My daughter and I made it for Mother’s Day and the entire family enjoyed it all week long! This cake, like everything else you make, looks delicious! And as a mother I’m touched that you made it for her. I was reading back through the blog, and excited to see that you were going to release some new pamphlets of recipes. Did that ever happen? Good luck at med school and in all your endeavors! How much batter do you put into each pan? I followed the recipe word by word and it felt like I didn’t have enough to batter for both 8 inch pans. Thanks for your help. This looks amazing! I’m allergic to almonds. Is there a good substitute for almond flour? Hi! The homemade stevia is just a blend of erythritol + stevia that I make up myself. You could also use Truvia. 🙂 I use 1/8 teaspoon Stevia Select stevia powder for every 2 Tablespoons of erythritol. Mixing those 2 creates a homemade Truvia that I call “Homemade Sweetener Blend.” It is cheaper than buying Truvia, though. Does that make sense? Hi Lauren. I’m also confused about the filling. It says to add sweetener but an amount is not given in the instructions. I’m assuming the 3/4 cup stevia/truvia is for the cake not the filling. Can you please help me out? I’ve already baked the cakes and hoping to make the filing now. I’m making this for mom for Mother’s Day like you! Thank you! p.s. If anyone else knows this answer and could help out it would be very much appreciated. Hi! I would LOVE to make this cake! I just have one question, do you add the 2-3 cups of unsweetened dried coconut to the cake batter or is this just for decorating the cake? Did you use it in the cake batter? I am making this cake now and confused! Please help! Can anyone tell me of the coconut goes in the cake batter or just on top for decoration? Also, what about the geletin? Has anyone made this cake… How has it come out?? Libby, the coconut is pressed into the sides for decoration. It does not go in the cake batter. Updated the post to clarify. 🙂 Thank you for your question! I’m trying to make this cake right now but the filling is coming out soupy and I don’t know why. Also, how much “sugar” do we add to the filling? Hi. I made this last night and after reading some of the comments I was very excited about the end result. Sadly, I can’t agree with most of you guys. My cake barely tasted like coconut and it felt like the sourness of the sour cream and the cheese were the predominant flavors. I added as much sweetener as I could but there was a point where it wasn’t making any difference so I just continued and hoped for the best. Anyone else have this issue of a sour-y cake? I made this cake for Easter, but did not make filling as the sweetener amount is never listed in the ingredients! I have ready through all the comments and several people have asked, but it is never answered. How much sweetener goes into filling??? I know, this is driving me crazy! It keeps getting asked and no one will answer it! I will definitely prepare this cake for my friend who is diabetic.If almond flour is not available can I use regular flour..Is almond diabetes friendly? Is there an option for you to offer a print button? Hi! In the recipe for the filling, it says to grind the sweetener…only there’s no measurement for sweetener in the ingredients list. How much? This looks fabulous! My hubby and I follow a LCHF diet and our anniversary is Monday. 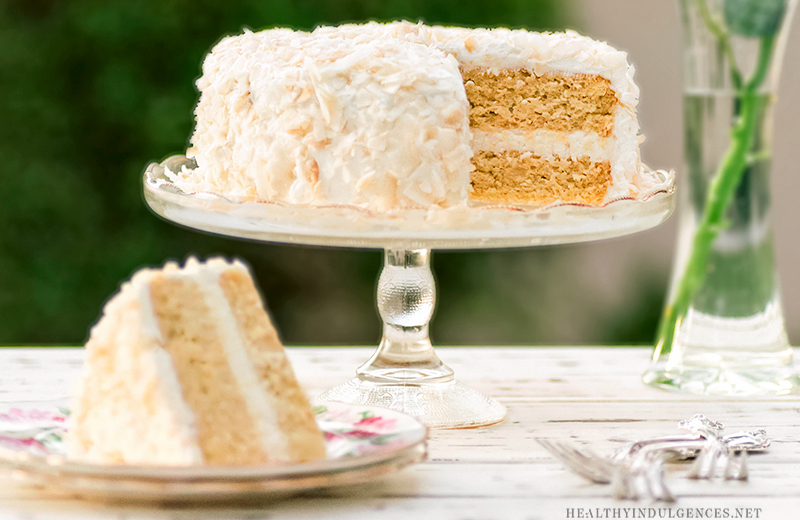 Coconut cake is one of his faves — Might just have to give this a whirl!! I was wondering how much sweetener to use in the filling?? Each layer of the cake looks nice and plump. I just made it and it didn’t even cover the whole bottom of the cake pan. I even tapped it on the counter a few times. Is it a pretty thin cake and the pictures make each layer look bigger?